TNT has releases some additional bits of information regarding their upcoming summer programming. Viewers can look forward to the returns of The Last Ship, Major Crimes, Murder in the First, and Rizzoli & Isles — as well as the series premiere of Animal Kingdom. What do you think? 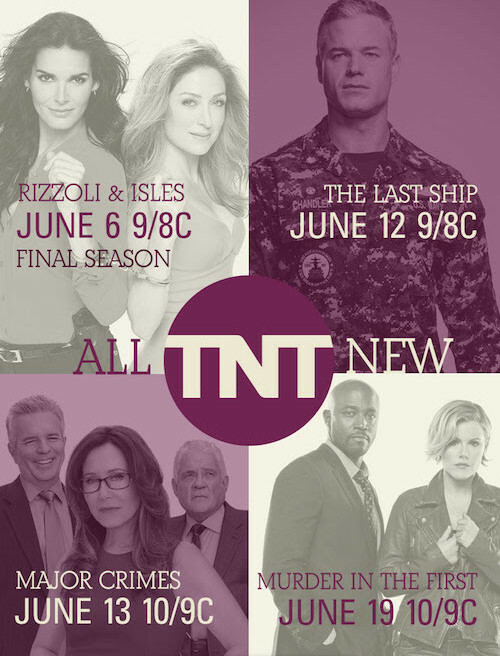 Do you plan to tune in for any of these TNT shows this summer? More about: Animal Kingdom, Animal Kingdom: canceled or renewed?, Major Crimes, Major Crimes: canceled or renewed?, Murder in the First, Murder in the First: canceled or renewed?, Rizzoli & Isles, Rizzoli & Isles: canceled or renewed?, The Last Ship, The Last Ship: canceled or renewed?, TNT TV shows: canceled or renewed? im so happy all these shows are renewed!!!!!!!!!!!!!!!!!!!!!!!!!!!!!!!!!! I am very unhappy that Major Crimes is moving to 10pm. That is not a good sign for the continuation of this series! I hope cooler heads at TNT prevail and they see that Major Crimes and Rizzoli & Isles are the best hope they have of that network continuing! IMO Major Crimes is their best show! !